APA Sheathing-grade panels are not manufactured with smoothness or appearance in mind, but offer strength suitable for most industrial applications. Common veneer grades used in APA Rated Sheathing are C or D, or a combination of the two. 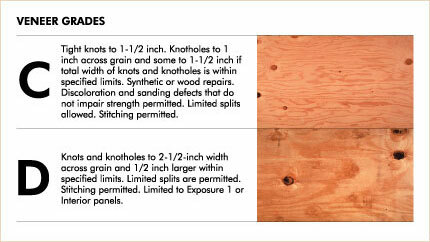 APA Rated Sheathing is also typically available as oriented strand board (OSB). Panels for industrial applications can be manufactured in a variety of ways – as plywood (cross-laminated wood veneers), as composites (veneer faces bonded to wood strand cores) or as oriented strand board (OSB). For full description of veneer grades, consult Panel Design Specification, Form D510. For many industrial-type applications, including product and system components, truck trailer liners, crates and pallet decks, Exposure 1 panels are suitable. For uses not permanently exposed to elevated moisture exposure, especially export packaging and refrigeration applications, Exterior panels are recommended for repeated wetting and redrying or long-term exposure to weather or other conditions of similar severity. For more information on the difference in bond durability classificaiton, visit the Durability page. 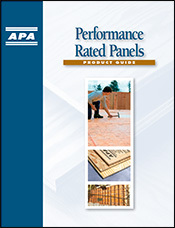 APA Rated Sheathing panels carry numbers in their trademarks called Span Ratings. The Span Rating appears as two numbers separated by a slash, such as 32/16, 48/24, etc. The larger the span rating numbers, the stronger and stiffer the panel regardless of panel thickness. Plywood is manufactured from more than 70 species of wood. These species are divided on the basis of strength and stiffness into five groups under Voluntary Product Standard PS 1-09 – Structural Plywood, Form L870. Strongest species are in Group 1; the least strong in Group 5 (see Table 1 in PS 1-09). The group number that appears in the trademark on some APA trademarked panels – primarily sanded grades – is based on the species used for face and back veneers. Where face and back veneers are not from the same species group, the higher group number is used, except for sanded panels 3/8-inch thick or less and decorative panels of any thickness. These are identified by face species because they are chosen primarily for appearance and used in applications where structural strength is not critical. Sanded panels greater than 3/8-inch thick are identified by face species if C- or D-grade backs are at least 1/8-inch thick and are no more than one species group higher in number than the face species group number. Some species are used widely in plywood manufacture; others rarely. Check local availability if a particular species is desired. The strength axis, usually the grain direction of the wood veneers or strands (unless the strength axis is otherwise identified), should run across the stringers for greatest strength. A common edge treatment is a tongue and groove edge that is used when engineered wood panels are placed together with their long edges adjacent to each other (one edge has a groove milled into it and the other a tongue). By joining tongue edges into grooved edges, a strong connection is created. Also, different edge treatments are available for panels through a secondary manufacturing process. Research has shown that a square edge on a panel deck performs as well as a bull-nosed edge and slightly better than a chamfered edge when edges are exposed to certain types of impacts. These panels are especially designed for engineered applications such as structural components where design properties including tension, compression, shear, cross-panel flexural properties and nail holding and bearing are of significant importance. Please see section 5.6.5 Structural Panels in Voluntary Product Standard PS 1-09 – Structural Plywood, Form L870 for details on veneer species and grade and bond durability requirements. Describes performance standards for structural wood panels and the compositions of different types of APA panels with the Performance Rated designations of APA RATED SHEATHING, APA RATED STURD-I-FLOOR and APA RATED SIDING.